Your ideal night out is an upscale meal paired with a symphony concert; however, you’re equally comfortable strolling through a sculpture park and topping off your night with a custom cocktail. Your must-see attractions include art galleries, culinary hot-spots or locations that embrace your zest for hands-on creativity. Indulge in a craft beverage at Kozy Yak Brewery and Fresar Winery in Rosholt or visit Central Waters Brewery in Amherst, powered by over 1,000 square feet of solar panels. Discover dinosaurs, geology and more at the Museum of Natural History or engage with hands-on exhibits at the Central Wisconsin Children’s Museum. Rejuvenate mind, body and soul at the Qi Garden Salt Spa or Wellness Spa. Pay your respects at the Korean War Memorial of Wisconsin in Lake Pacawa Park before delving into one of 40 flavors of Wisconsin brews at O’so Brewing Company. Tour the Stevens Point Brewery, one of the oldest continuously operated breweries in the nation. Insider tip: after your tour, don’t forget to sample their flavored sodas! For a mix of retail and art, visit Gallery Q or plan to attend the annual Hidden Studios Art Tour (hosted each fall) for high-quality pieces from local artists. Create your own work of art at Clay Corner Studio or Blue Bead Trading Company. If crafting is more your style, visit Herrschner’s world headquarters to stock up on supplies. End the day with a live performance by the Central Wisconsin Symphony Orchestra at the @1800 Theater or catch a show in the Noel Fine Arts Center. Don’t forget to check out the Tomorrow River Concert Series presented at the Jensen Community Center. Shop local favorites like Girls In Pearls Boutique, Call It New/Call It Antique, a two-story antique and consignment store or Agora Local Makers Market. Drop by Scarabocchio Art Museum, Riverfront Arts Center or Carlsten Art Gallery for the latest exhibit. Stop in to Sunset Point Winery, which often offers live music, to relax in hammock-like chairs and sample wine made from traditional grape varietals. Top off your day at Great Northern Distilling for craft made spirits and specialty cocktails. Don’t leave without trying the Perfect Storm cocktail, featuring their award-winning Opportunity Rum. Launch an outer-space adventure at the Allen Blocher Planetarium on the UW-Stevens Point campus before visiting Locomotive No. 2713, a 100+ year old restored locomotive. Stop for a photo op at the Stevens Point Sculpture Park, located off the Green Circle Trail. Stroll through the historic downtown Stevens Point district to view murals depicting the region’s rich history. 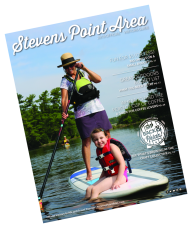 Take a self-guided tour along the Polish Heritage Trail or Heritage Park to catch a historic glimpse into the Stevens Point Area.